Like, with a real, full-time job, a reliable bank account and retirement savings. After graduation, I didn’t have much money left, so I moved back home. Living under my parents’ roof kind of feels like I’m cheating, and I know I’m lucky to have this option to help me make ends meet. More than half — 52% — of Americans are struggling to make ends meet, according to a new report from the FINRA Investor Education Foundation. The foundation recently released its Financial Capability in The United States report, which surveyed 25,000 American adults about their “financial capability” — a term that refers to your spending knowledge, resources, access and habits. Making ends meet and being financially capable don’t just hinge on your individual financial status. A lot of factors directly correlate to our country’s economic status, so keep that in mind. The good news comes first: The national economic temperatures are improving. Today, compared to the depths of the recession in 2009, fewer Americans have difficulty paying their bills, and the number of Americans who say they are satisfied with their financial situation has nearly doubled. Unemployment has also decreased, which almost makes everything more bearable. However, it’s not all sunshine and rainbows on the financial front. 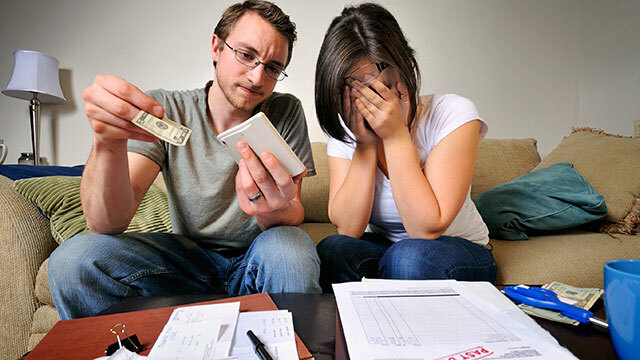 Although fewer Americans struggle to pay bills and the number of Americans satisfied with their financial situation has doubled, there are still 69% of us — me included — who report being unsatisfied with our financial situations. If you’re like me and want to become more financially savvy and competent, do some reading and get motivated. I feel confident that, with some patience, diligence and a whole lot of penny hoarding, I — and you! — can get everything under control. Feeling like you never have enough cash is hugely challenging. Here’s how to stop living paycheck to paycheck, and start saving some money. When you can’t cut anything else from your budget, you have to increase your income. Find a side job to rake in some extra money each month. Pay off your credit card debt. It won’t be easy, but finally making that last payment will be a huge relief because you can stop paying interest and focus on the essentials. Take a good, hard look at your monthly bills and expenses. Determine what’s necessary and what’s not, and start negotiating. You need to eat, but you don’t have to break the bank to do so. Use these strategies to save money on groceries and household essentials. Start an emergency fund. If any unexpected bills pop up, this will save you. Has it been a while since you talked to your boss about money? Looking for a new job? Consider negotiating your salary or asking for a raise. Look for the freebies in life. And if your birthday’s coming up, definitely take advantage of the free stuff! We can do it, Penny Hoarders! Here’s hoping all of our numbers continue to improve. Your Turn: What other advice do you have for those of us struggling with our financial situations?